An eggplant dish such as eggplant Parmesan, which is breaded and fried and smothered in cheese, isn't particularly healthy, but eggplant can be part of a nutritious meal if you cook it in more healthful ways. About half of your plate at each meal should be filled with fruits and vegetables, and you should get at least 2 to 3 cups of vegetables a day, according to ChooseMyPlate.gov. Opting for nonstarchy vegetables, such as eggplant, can help you keep you calories down while meeting your recommended vegetable intake. One cup of chopped, boiled eggplant has only 35 calories, almost all of which comes from the 8.6 grams of carbohydrates it contains. This serving also has 0.8 grams of protein, 0.2 grams of fat and no cholesterol. 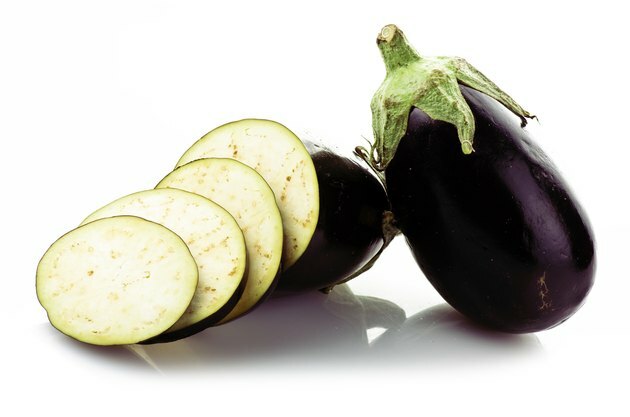 Although it isn't a particularly good source of any micronutrients, it does provide 6 percent of the daily value, or DV, for manganese, 5 percent of the DV for thiamine and 4 percent of the DV for both vitamin B-6 and vitamin K.
Eggplant is a good vegetable choice for people who are trying to lose weight, as it is a low-energy-dense food, meaning you can eat a large amount of it without consuming too many calories. Low-energy-dense foods help you feel full without putting you over your daily calorie limit, since it is the volume of food that fills you up, not the calories, according to the Centers for Disease Control and Prevention. Each 1-cup serving of eggplant provides 2.5 grams of fiber, or 10 percent of the daily value for fiber. Fiber may help you lower your cholesterol, control your blood sugar, and limit your risk of heart disease and digestive issues, such as constipation and diverticulosis. Since fiber absorbs water, it also helps you feel full without adding extra calories, potentially making weight loss easier. Steaming is a particularly healthy cooking method for eggplant. A study published in "Nutrition Research" in December 2007 found that when eggplant was steamed it bound more bile acids. This lowers fat absorption and cholesterol levels, potentially decreasing your risk of heart disease. Baking and grilling are other low-fat ways to prepare eggplant. Avoid frying, as eggplant tends to absorb a lot of oil unless you salt it and press out the water and air in the eggplant beforehand. You can also use pureed eggplant as a substitute for up to half of the fat in baked goods, although it may soften the texture of the final product somewhat.